Is a morning massage crazy? Maybe. But here are three great benefits and one awesome offer when getting a morning massage. 1. It boosts your energy. Before grabbing that cup of coffee, consider some additional ways to get that morning boost. Massage isn’t just for relaxing. Stretching out and loosening those tight muscles allows you to start the day right and gives you the boost in energy that your body craves. When you wake up in the morning, stiffness saps your body of energy that it so desperately craves. Exercise in the morning has been shown to boost your energy, but let’s face it, exercise in the morning while it sounds great, it’s pretty difficult to stick to. But massage on the other hand is a great alternative for starting the day off right. Getting a massage in the morning can help make your body feel and perform better by getting out the kinks that you feel in the morning and the soreness and stress caused by a “bad” night’s sleep. Try a morning massage and see how productive your day can be. A Thai Combo massage is a great way to boost your energy for the day. 2. Works out those morning kinks. Every wake up and it takes you 15 or more minutes to get out of bed because you feel as stiff as a board. Feeling stiff when you first wake up in the morning is a common problem for many people. Morning stiffness causes you to hurt all over throughout your body as you crawl out of bed. As you try to get out of bed, your joints and muscles ache so much, you may just want to crawl right back in bed. In fact, morning stiffness can be the most severe pain you feel all day and it can impair or interfere with your ability to function throughout the day and perform to your best ability. Getting a massage in the morning may be just what you need to make those morning kinks a thing of the past. Both Swedish and Deep Tissue full body massage are a great option for working out those morning kinks. Need some morning motivation? Doing something special for yourself is a great motivation booster. Pamper yourself with a massage and start the day right. Massage used to be a luxury item for the select few. Now, it’s a common practice for many. For only $35 for a one hour Asian Style Body and Foot Massage at the Happy Head, you can feel like a million bucks for a few dollars. And with this massage you don’t need to undress or use oil so you can do it in the morning right before you start your day. Waking up and starting your day with a great massage may just be the thing you need to conquer the day. 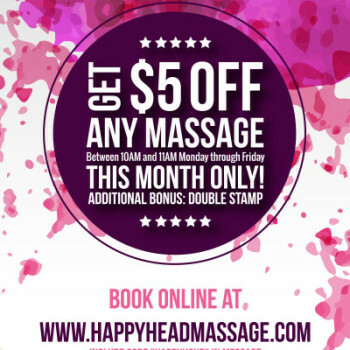 For the month of October 2015 only, get $5 off any massage booked 11am or earlier Monday through Friday when you book online and use code “HAPPYHOUR” in the message section. Enjoy.